It’s time for ghouls and goblins — as well as trick-or-treaters — to come out to play. But do take care. Children are more than twice as likely to be fatally struck by a car on Halloween as on any other day of the year, according to Safe Kids Worldwide, a nonprofit organization that helps families and communities keep children safe. With that scary statistic in mind, the Los Angeles Airport Peace Officers’ Association (LAAPOA) would like to share a few public safety tips to ensure the safety of both children and adults this Halloween. Consider adding reflective tape or striping to costumes and trick-or-treat bags for greater visibility, the American Academy of Pediatrics (AAP) suggests. Test makeup ahead of time on a small patch of skin to make sure there are no unpleasant surprises on the big day, the AAP says. Set the route that you and your children or group will be taking. Review with children how to call 9-1-1 (or their local emergency number) if they ever have an emergency or become lost, the AAP advises. 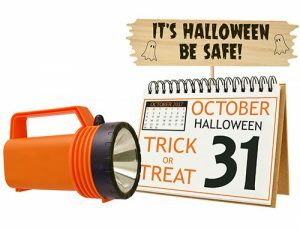 Carry flashlights when accompanying trick-or-treaters. Examine all treats before allowing children to eat them. Throw away any candy that is not commercially wrapped, has a torn wrapper or shows any other sign of tampering. Keep choking hazards such as gum, hard candies and small toys away from younger children. If your child has a food allergy, carry an epinephrine auto-injector anywhere there may be Halloween candy, the Food Allergy & Anaphylaxis Connection Team recommends. Be aware that candy is at high risk of containing trace amounts of common allergy triggers, because factories often produce many different products, the AAP cautions. Also, “fun size” or miniature candies may have different ingredients or be made on different equipment than the regular-size candies, meaning that brands your child previously ate without problems could cause a reaction. Give fruit or baked homemade treats only to children you know, and accept them only from people you know. Tell children to stay away from open flames, including jack-o-lanterns with candles in them. Be sure they know how to stop, drop and roll if their clothing catches fire, the National Fire Protection Association urges. Have them practice stopping immediately, dropping to the ground, covering their face with their hands, and rolling over and over to put the flames out. Never go out alone on Halloween. Walk, don’t run, and always use sidewalks. Never take shortcuts through backyards or alleys, and always look in all directions before crossing the street. Wear costumes that are flame-resistant. Wear well-fitting masks, costumes and shoes to avoid blocked vision, trips and falls, the Centers for Disease Control and Prevention (CDC) advises. Avoid wearing decorative contact lenses. While the packaging on decorative lenses will often make claims such as “one size fits all” or “no need to see an eye specialist,” using decorative contact lenses without a prescription is both dangerous and illegal, the AAP says. This can cause serious eye disorders and infections, which may lead to permanent vision loss. Only use props, such as swords, if they are made of pliable material, the CDC recommends. Never use realistic replica firearms or pack them for travel. Keep chocolate and sugar-free candies that have the sugar substitute xylitol in them away from cats and dogs. Both ingredients can harm them. Keep Halloween decorations and wires out of reach. Most pets should be kept away from the front door and trick-or-treaters. Make sure your pet is wearing proper identification, in case of escape. If you are traveling by plane during Halloween and you insist on wearing a costume, ensure that it doesn’t get you into trouble; check the Transportation Security Administration website to find out what is allowed aboard an aircraft. As always, the safety of both the traveling public and the communities surrounding our airports is paramount. If you see something, say something. In an emergency, contact 9-1-1. We wish you a safe and happy Halloween.